for more updates. I look forward to seeing your feedback and comments there. Applications that create content (Twitter, blogs, Flickr) have become so numerous that it is now necessary to organize that content in an efficient manner. RSS has done wonders for syndicating blogs, and there are a large number of ways to organize tweets. In my excitement about Friend Feed, I payed no attention to another useful aspect of Friend Feed: “It’s also fast and easy to start discussions around shared items” (taken from their About page). Then I saw this tweet from Robert Scoble about how he would be discussing energy on Friend Feed. No matter where he discussed energy that night, everything he said was aggregated on his Friend Feed page. Much of what he did was available for comment, even his tweets. In short, Friend Feed pastes the pieces of conversations that Web 2.0 applications tear apart. It helps cut through the noise that applications that produce content can (and often times do) generate. It does it in a way that makes keeping the conversation convenient. And while it’s not the RSS feed to end all other RSS feeds (what about when you want to organize feeds by topics? ), it’s darn convenient. Check out my Friend Feed account. I know and have worked with a guy who is amazing at coming up with creative ideas to meet objectives in public relations campaigns. He is, quite literally, an idea generator. In one brainstorming session, he spits out literally hundreds of ideas ranging from completely far-fetched to almost practical. Unfortunately, I was never able to realize his potential in any of my campaigns because he could never convince me that any of his ideas were worth pursuing. Being able to sell an idea is essential in a public relations campaign for people who want their ideas to play a role in the success of a campaign. Because campaign managers don’t have the time or the money to chase down every rabbit hole idea generators throw at them, idea generators need to convince campaign managers that their ideas are worth investing both time and money in. Even after effectively communicating the idea, the idea generator has to be prepared to further defend their idea. A campaign manager may think the idea sounds great, but they will often voice their concerns (which the idea generator may not have anticipated) and expect the idea generator to answer them on the spot or find out the answers later. Sometimes, this means implementing a mock version of their idea on their own time to prove to their campaign manager that their idea is plausible. 1. It shows the campaign manager that the idea was good enough for the idea generator to put in time and effort to create an example. 2. It provides more answers to the questions and concerns that the campaign manager might have about the idea. In most cases, being an “answer man” is a sure way to get ignored. But because campaign managers have thousands of different aspects of a campaign to pay attention to, being an “answer man” in regards to your idea is a good way to increase the chance of having your idea used in a campaign. Social media makes it easy to create a visible presence on the Internet for marketers, public relations professionals, and journalists. Unfortunately, it seems that spammers have infiltrated Twitter. Every time I update my twitter feed, a different spammer decides that then is a good time to start following me. In order to keep my friend feed clean, I’ve started blocking spammers automatically. So when Zee M Kane of We Do Creative started following me on Twitter, he was two seconds from being blocked just like any other spammer. But his feed was longer than most Twitter spammers, and he had a good following to follower ratio (2:1 is good; Zane has one of almost 1:1). I looked through his profile and his tweets and found out that Zee’s company We Do Creative has a branch specifically for public relations. I had a sneaky suspicion that Zee didn’t just add any tweeter who updated more than twice daily. I sent him tweet asking him why he added me, and he tweeted back saying he recognized that he made an effort to add people relevant to his industry. Follow a specific audience. Tweeters who have good following to follower ratios don’t add people who are irrelevant to their tweets. If you are in the automotive industry, don’t start adding tweeters who specialize in neurosurgery (unless neurosurgery is important to you, and even if it is, don’t expect them to follow you back). Don’t ignore @messages or replies. One of the things that impressed me about Zee’s feed was that he responded to both my @messages promptly despite having close to 1,000 followers. Recognizing your followers and responding to them will keep them from removing you from their twitter feed, and in some cases, will inspire them to add you. Engage your Audience. Go beyond just replying to your audience. Make your tweets interesting to whatever audience you’re trying to build. If you are a tech blogger, link and/or comment on the newest apple gizmo. If you are a coffee shop owner, tweet about a new drink you made. Stay up to date with the latest news in whatever field you specialize in and tweet about it. Twitter is a powerful way to communicate ideas, but it is only as powerful as the number and type of people you have following you. By adding people who are irrelevant to your tweets, you are guaranteed to be seen as a spammer. Pay attention to who you add and take care of who you add if you want to see your follower count skyrocket. After a brief haitus, I’ve decided to revive Stop the (Word)Press. I started this blog as an assignment for my Advanced Public Relations writing class, but I believe that this blog has created a niche for itself in the realm of social media for public relations. By reading social media website blogs, finding out what other people had to say about social media and by applying my own (limited) experience as a public relations practitioner, I’ve been able to comment on different social media tools, trends, and methods of use in the world of public relations. While this method worked for my class, I always felt as if my posts were similar to research papers containing only third party research. Through engaging in social media and talking one-on-one with prominent social media users, I’m better prepared to bring original thoughts and comments on social media. I’m also planning on expanding the scope of Stop The (Word)Press. This site used to be devoted solely to social media, but I also want to make posts based on my (again, limited) experiences managing public relations campaigns. One of the best ways to gain rapport on Digg is to study Digg’s culture. A Digg user who has a grasp of the culture will be able to recognize content that is interesting to Digg users and will be able to avoid submitting content that Digg users will dislike. To find out what I’m talking about, visit Digg’s website, click on the world & Business button, and look at the top stories on the right hand side. Because it is elections season, a lot of presidential candidate news makes it to the “Hot” section (column on the right side of the webapge). 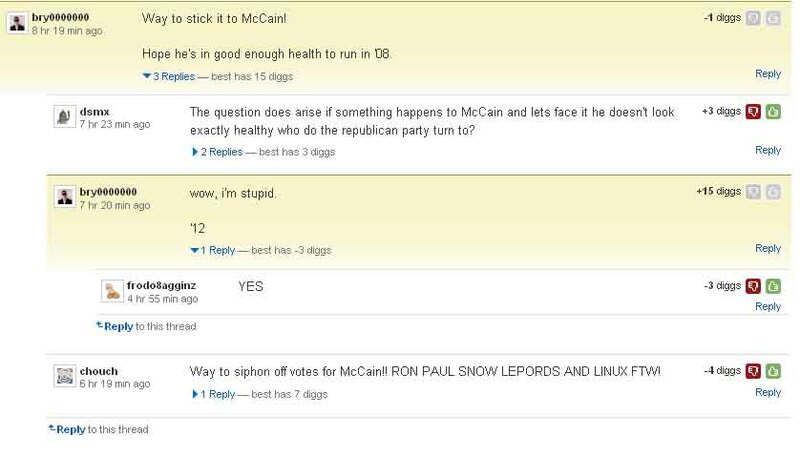 You’ll also notice that Digg users tend to like certain candidates (Barack Obama, and formerly Ron Paul) and have a certain distaste for other candidates (John McCain, namely). It almost goes without saying that a story that features John McCain in a positive light, or portrays Barack Obama negatively, will probably not become a popular story on Digg. Another way to become familiar with the Digg culture is to read the comments on a submitted story. What’s interesting about Digg’s comment section is that users can digg comments the same way they digg stories. To get a feel for Digg culture, look at what people are saying about top ranked stories. Don’t just look at the comments with the most diggs; check out comments that are “buried” (the opposite of “dugg”). After you have a feel for how the Digg community reacts to comments, start commenting on stories (but make sure to either digg or bury the story first, otherwise you’ll lose rapport). Keep in mind that in order to have a lot of digg users read your comment, you need to comment on a story before it reaches the Top 10 section on the front page. The best way to get people to see your comments is to comment on a story that is in the “Upcoming” section of Digg. If the story gets popular, your comment will appear higher on the page and more users will digg (or bury) it and respond. A comment I posted about a Fox News poll recently got close to 200 Diggs. I originally found the story on the Upcoming section, but it reached the #1 spot on the Top Ten stories list. When commenting, it is important to clearly communicate your message. I dropped the ball on this one when commenting on a Ron Paul story. I had intended to say that I hoped Dr. Paul would be healthy enough to run for President in ’12, but I made a typo in the original comment that suggested that I hoped McCain would be healthy enough to run again in ’08. As a result, my initial comment was dugg down, but after I clarified myself (a little better, but the modified comment was also a little ambiguous), I received some positive feedback. Update: I changed my Del.icio.us widget on the right to display Digg article’s that I’ve bookmarked. I’ll be researching more and posting hte interesting ones as I find them. Digg.com is the epitome of internet democracy. Users submit news stories to the site while other users rank them by “digging” the story. Digging a story is simple; login (create an account if you don’t have one), find a story you like, and click on the “digg” button next to the story. Stories with enough “diggs” will be moved to a column on the right side of the page which features the top 10 “dugg” stories on Digg. It’s easy to see why companies and public relations practitioners should become familiar with Digg: a story that makes the top 10 column can receive a significant increase in site visits. Do not digg your own content or a client’s content: This is a cardinal sin in the world of Digg. Self promotion is frowned upon by the Digg community and will quickly ruin your reputation on Digg. If you must submit something on Digg on behalf of your client, identify yourself as a public relations practitioner who is digging on behalf of a client. Make friends on Digg: Digg is a social networking site in that users can link to each other’s profiles and identify each other as friends. Friends are able to see stories that you submit, stories that you digg, and comments that you submit. Of course, you have to establish yourself as a creditable digg user before people will add you as their friend. Do this by digging stories that are interesting to you and making comments that other diggers find entertaining or useful. Digg has its own culture, so what diggers find interesting may be different than what most other social media users find interesting. Get RSS feeds from popular news sites that cover your beat: If you’re involved in political public relations, you’ll want to subscribe to the Huffington Post, the New York Times, the Washington Post, and Fox News (if you research the culture of Digg you will see why Fox is included) in order to be the first to submit breaking news. For technology, subscribe to Lifehacker and Engadget, just to name a few. Subscribe to blogs or websites that talk about what you’re representing as a practitioner, then use your RSS feed to be the first to post breaking news. There are many different tips and strategies to becoming a power user on Digg. One of my goals is to become a power user on Digg in order to make myself more marketable as a social media professional. I’ll keep this blog updated with my successes and failures in the world of Digg throughout the summer. To find out more about becoming a better digg user, check out my Del.icio.us page. I’ll keep updating it as I find new content. Update: I forgot to post a link to my Digg profile. Add me if you’re on Digg! I am a Journalism Student at the University of Oregon and the Public Relation's Officer for the International Student Association.